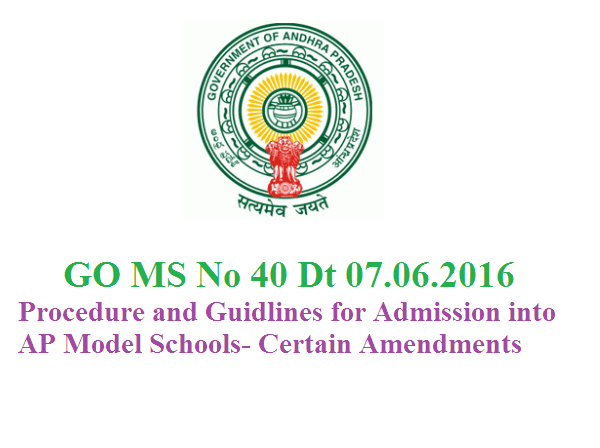 GO MS No 40 Procedure and Guidlines for Admission into AP Model Schools Secondary Education- Guidelines and procedure for admissions of students into Model Schools in the State of Andhra Pradesh from the Academic Year 2013-14- Amendment - Orders-Issued. In the circumstances reported by the Commissioner of School Education & Ex- Officio Project Director, A.P. Model Schools, Hyderabad in the reference 2nd read above, after careful examination of the matter, Government have decided to make amendment to guidelines and procedure for admissions into Model Schools issued vide G.O. 1st read above and accordingly, Government hereby issue following amendment to G.O.Ms.No. 17, Education (SE-Prog.I) Dept, dt. 11.02.2013. 2. The Commissioner of School Education & Ex-Officio Project Director, A.P. Model Schools, Hyderabad shall take further necessary action in the matter accordingly.